1. Mastermind Creations Hexatron Now Instock! Feral Rex - Leo Dux - Preorder Up! 2. TFC Toys - Uranos F-4 Phantom and F-15 Eagle limited stock remaining! So far there is no announcement of a giftset and TFC says they're out of the first 2 pieces. We should have Harrier II instock late next week or early the next, and the final piece shipping out at the end of the month. So this may be the only window to pick up all 5 together if they don't do a giftset. 3. Botcon 2013 Figures Now Instock, TFCon Exclusives Preorders Up! Our Botcon 2013 figures are now instock! Order here! TFsource - Your source for Botcon exclusives! From the exclusives, panels and guests, upcoming Hasbro TF product reveals and more, read on for all the highlights! 4. Masterpiece Update! MP-12 Masterpiece Sideswipe Now Instock! Note: information is subject to change as these are preliminary listings. Takara Tomy announced that MP-19 smokescreen will be significantly different in design from prowl & bluestreak. Our guess is this will push the release date back further, but no official announcement on this yet. Back instock - CA-09 Car Crash and CA-10 T-Bone! Fansproject - Causality CA-10 T-Bone! Fansproject - Causality CA-09 Car Crash! 6. Transformers Licensed T-Shirts Up for Preorder! We've just uploaded some preorders for some great Transformers T-shirts! These are officially licensed and have some great retro, and more modern designs. There are 10 designs in total so check them all out! TFsource - Your Source for Transformers Licensed T-shirts! 7. 3rd Party Customs Update! 8. iGear Mini Warriors - Cogz, Duneraker, Veer & Bushwacker instock! 9. Now up for preorder: Titan Class Metroplex! 10. Now instock - Encore #23 Fortress Maximus - regular release! The Long Wait is Over! The BIG Guy Fortress Maximus Now Instock! Standing around 2 feet tall and wielding his master sword, Fortress Maximus and the 25 year wait is now over! Order yours today at TFsource! Encore #23 Fortress Maximus - regular release! 11. Transformers Generations Update! KRE-O Combiner and Generations Wave 04 Preorders Up! New KRE-O Combiner Preorders Up! TFsource - Your Source for KRE-O Combiners! Transformers Go! Product Delay. Takara has recalled all Jinbu jet pieces due to a hip swap issue. We heard it's a pretty minor thing, and our apologies for the delay in preorders, but we would prefer to ship our customers the non-defective toys and we'll have our stock in later this month. TFSource Sponsored reviewer Peaugh has also put up reviews of the latest Transformers Go figures, all of which you can watch on each product page. G-01 Kenzan (Police Car), Jinbu (Jet), and Ganou Samurai (Firetruck) are all up so enjoy the videos while takara makes the fixes! New Preorders and Photos of Transformers GO! G08 Budora, G21 Judora, G09 Goradora and More! Preorder yours at TFSource here: TFsource.com - Your Source for Transformers Go! Figures! TFsource - Your Source for Transformers GO! Figures! TFsource - Your Source for Transformers Japanese Generations! TFsource - Your Source for Transformers Go! Combiner Full Sets! New Preorder up: Transformers Generations Japan - TG25 Fall of Cybertron - Orion Pax & Megatron Set! These have some great metallic paint apps, and coloring that differs compared to the US Hasbro versions and is sold in a giftset. Preorder yours today! 12. 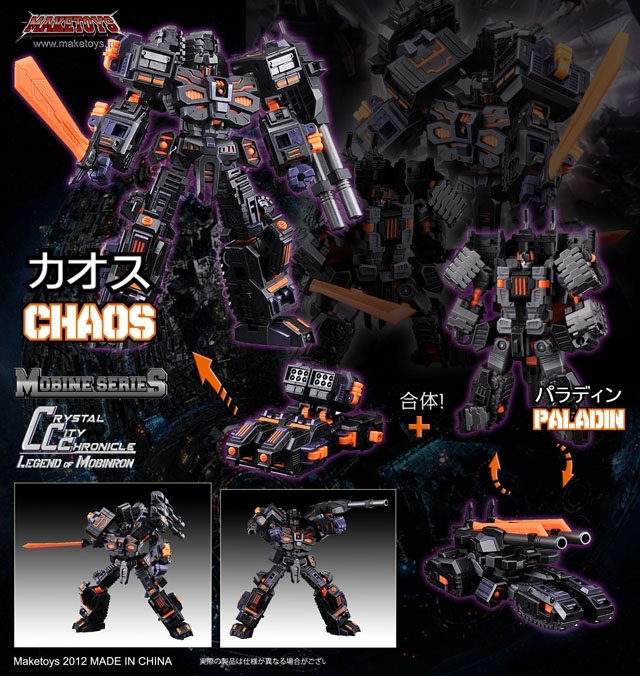 Now up for preorder - Make Toys Paladin/Chaos! If we receive any additional stock after the first shipment, it will be via air freight which is much more costly, and the amount of available stock on this guy will be quite low, so we recommend preordering now! Make Toys - Mobine Series - Chaos Paladin! Now Instock from Make Toys - Yellow Giant! 13. Now Instock - Unique Toys - UT-W02 War Rhino! Unique Toys - War Lord - UT-W02 War Rhino! Unique Toys - War Lord - UT-W03 War Bison! Unique Toys - War Lord - UT-W01 War Hawk!